In the wild, chimpanzee troops are often distinct from one another, possessing collections of up to 20 traditions or customary behaviors that altogether seem to form unique cultures. Such practices include various forms of tool use, including hammers and pestles; courtship rituals such as leaf-clipping, where leaves are clipped noisily with the teeth; social behaviors such as overhead hand-clasping during mutual grooming; and methods for eradicating parasites by either stabbing or squashing them. While observing chimpanzees, evolutionary psychologist Antoine Spiteri at the University of St. Andrews in Scotland wanted to help settle the question of whether or not the apes learned such practices by watching others like humans do, as opposed to simply knowing how to perform such behaviors innately. Spiteri and his colleagues investigated six groups of chimpanzees, each with eight to 11 apes, living in captivity in Bastrop, Texas. 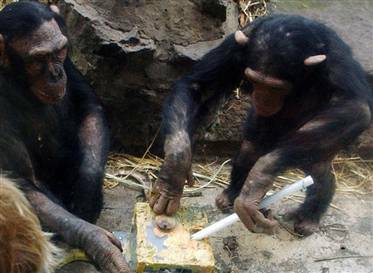 The researchers taught a lone chimpanzee from one group one technique for obtaining food from a complex gadget, such as stabbing food with a tool. They next taught one chimp from another group a different technique for extracting food from the same gadget, such as pushing it out down a ramp. Over time, the researchers found each technique for tool use and food extraction spread within each group. In essence, these groups displayed their own unique culture and local traditions. This short article contains several more details, for those who are interested. The complete research will be published in the 19 June 2007 issue of the journal Current Biology.